WASHINGTON — Amid the buffeting winds, sleet and snow of a late-winter storm, it was warm and dry in one spot perched above the District. 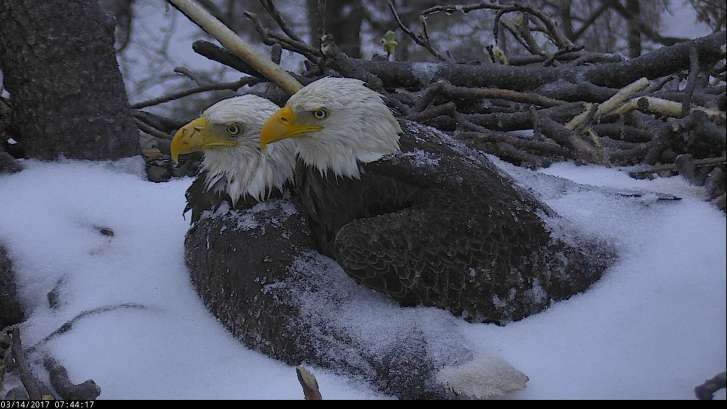 A pair of nesting bald eagles at the U.S. National Arboretum teamed up to protect their two eggs from the storm. The arboretum’s eagle cam captured both First Lady and her mate, Mr. President, atop the eggs. Mr. President joined his mate for several hours in the nest, adding an extra layer of warmth. The First Lady was seen sheltering her eggs from the storm Monday night and into Tuesday morning, the arboretum said. See video of the pair and their nest plus photos provided by the arboretum.